All the discussions we have about domestic cat socialisation concerns socialisation to humans. Little is known about the important time for kitten-to-kitten socialisation. I try and address the topic generally here. 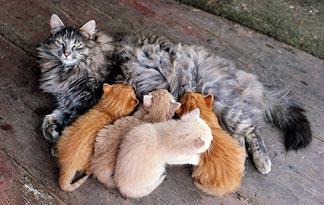 During the first two weeks kittens form an attachment to their mother. It is based on smell (olfaction). During the first four weeks of the lives of kittens they interact with siblings and may learn to recognise them. Bradshaw states that kittens are born with a ‘template as to what another kitten looks like, but this is easily overwritten if there are no other kittens available’. This ability to overwrite the template is why we sometimes see kittens being raised by dogs and accepting without question their littermate puppies. They don’t see anything unusual in that. Kittens are not, it seems, aware of what they look like and therefore what their siblings should look like. If they did they’d find it strange to be among dogs. However, Bradshaw says that kittens prefer the company of kittens. So it a puppy is introduced to a litter of kittens they accept the puppy but prefer the company of fellow kittens. Kittens appear to inherit the ability to form stronger attachments to their own species than to other four-legged animals. At five weeks of age, kitten littermates learn to play with each other. They learn boundaries, how far they can go in play before the other complains. A kitten from a litter of one will play rougher than a kitten from a litter of several cats. And kittens who have been hand-raised are relatively inept at play. Some are too aggressive and are avoided by other kittens. Other hand-raised kittens become strongly bonded to their human guardian and ‘seem barely to realise that they are cats at all’. I think this is imprinting on their human caretaker. 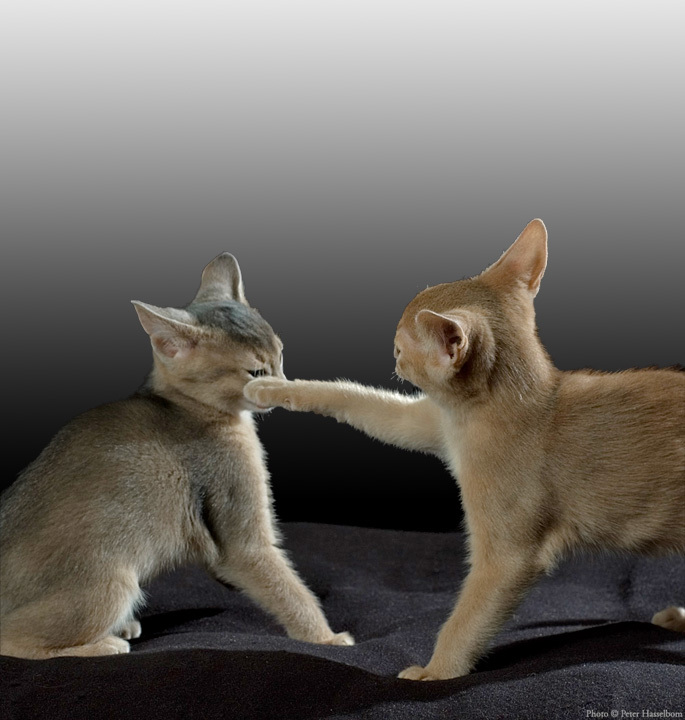 Hand-reared kittens miss out on these important kitten-to-kitten interactions and may develop extreme as opposed to a balanced personalities. Littermates become friendly towards each other and are happy to feed side by side, sleep in contact with each other and allogroom. Experts don’t know if littermates can recognise each other later in life after they have been separated and reunited. The third and fourth month of a kitten’s life – both male and female – is about play. It seems that this is an important contribution to developing the kittens into social animals. I remember making this video. We were in the living room of the owners, Martin and Kathryn Stucki of A1 Savannahs in Ponca City, OK, USA. The kittens were being socialised to humans and in the video we see them being socialised to each other. Being F2 and F1 Savannahs they play hard. The screaming is the F2 being pushed around too much by an F1 whose name was Focus as I recall. 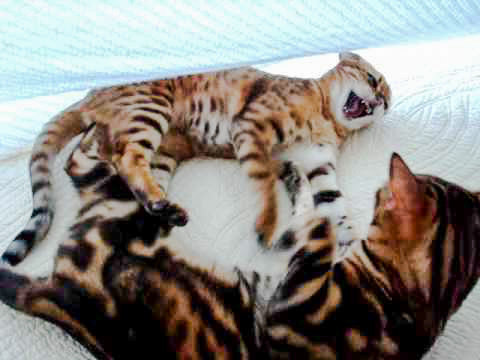 Savannah Kittens Play Rough and Noisy from Michael Broad on Vimeo. Note: I am indebted to Dr Bradshaw’s Cat Sense for guidance and the quotes. This book is available for download to Kindle. It is worthwhile because Kindles have a search facility. 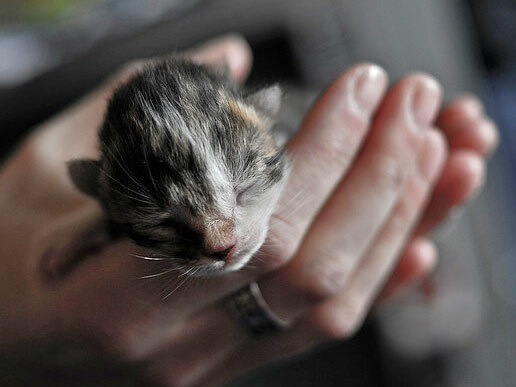 Can imprinting take place between young kitten and human? What does raised underfoot mean? This entry was posted in socialisation and tagged animal socialisation, cat behavior, cat play, imprinting, Kitten Development, kittens, socialisation by Michael Broad. Bookmark the permalink.